How do you think about statistical methods in science? Are statistics a matter of math and logic? Or are they a useful tool? 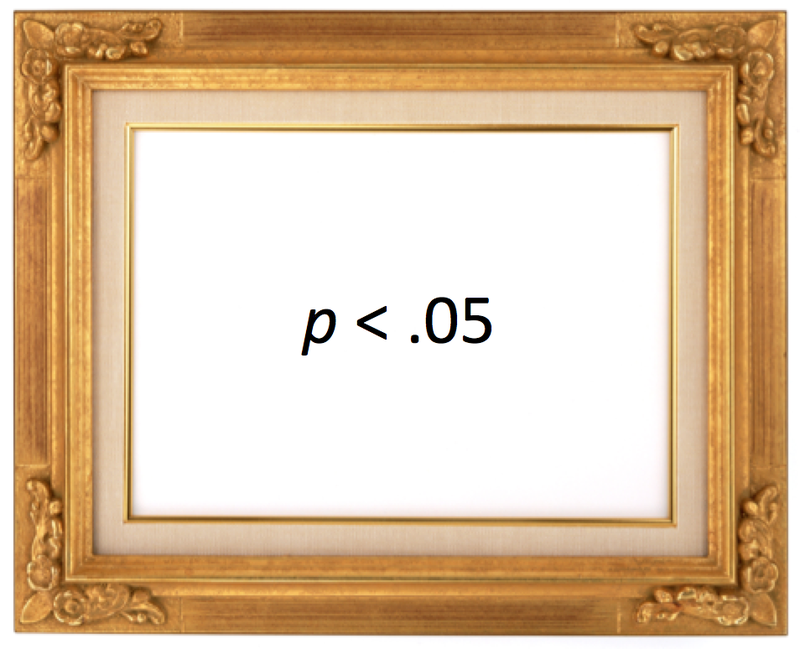 Over time, I have noticed that these seem to be two implicit frames for thinking about statistics. Both are useful, but they tend to be more common in different research communities. And I think sometimes conversations get off track when people are using different ones. Frame 1 is statistics as math and logic. I think many statisticians and quantitative psychologists work under this frame. Their goal is to understand statistical methods, and statistics are based on math and logic. In math and logic, things are absolute and provable. (Even in statistics, which deals with uncertainty, the uncertainty is almost always quantifiable, and thus subject to analysis.) In math and logic, exceptions and boundary cases are important. If I say “All A are B” and you disagree with me, all you need to do is show me one instance of an A that is not B and you’re done. In the realm of statistics, that can mean either proving or demonstrating that a method breaks down under some conditions. A good example of this is E. J. Wagenmakers et al.’s recent demonstration that using intervals to do hypothesis testing is wrong. Many people (including me) have assumed that if the 95% confidence interval of a parameter excludes 0, that’s the same as falsifying the hypothesis “parameter = 0.” E. J. and colleagues show an instance where this isn’t true — that is, where the data are uninformative about a hypothesis, but the interval would lead you to believe you had evidence against it. In the example, a researcher is testing a hypothesis about a binomial probability and has a single observation. So the demonstrated breakdown occurs at N = 1, which is theoretically interesting but not a common scenario in real-world research applications. Frame 2 is statistics as a tool. I think many scientists work under this frame. The scientist’s goal is to understand the natural world, and statistics are a tool that you use as part of the research process. Scientists are pragmatic about tools. None of our tools are perfect – lab equipment generates noisy observations and can break down, questionnaires are only good for some populations, etc. Better tools are better, of course, but since they’re never perfect, at some point we have to decide they’re good enough so we can get out and use them. Viewing statistics as a tool means that you care whether or not something works well enough under the conditions in which you are likely to use it. A good example of a tool-frame analysis of statistics is Judd, Westfall, and Kenny’s demonstration that traditional repeated-measures ANOVA fails to account for the sampling of stimuli in many within-subjects designs, and that multilevel modeling with random effects is necessary to correctly model those effects. Judd et al. demonstrate this with data from their own published studies, showing in some cases that they themselves would have (and should have) reached different scientific conclusions. I also wonder if this might contribute to the prevalence of less-than-optimal research practices (LTORPs, which includes the things sometimes labeled p-hacking or questionable research practices / QRPs). I’m sure plenty of scientists really have (had?) no idea that flexible stopping rules, trying analyses with and without a covariate to see which way works better, etc. are a problem. But I bet others have some general sense that LTORPs are not theoretically correct, perhaps because their first-year grad stats instructors told them so (probably in a Frame 1-ey way). But they also know — perhaps because they have been told by the very same statistics instructors — that there are plenty of statistical practices that are technically wrong but not a big deal (e.g., some departures from distributional assumptions). Tools don’t have to be perfect, they just have to work for the problem at hand. Specifically, I suspect that for a long time, many scientists’ attitude has been that p-values do not have to be theoretically correct, they just have to lead people to make enough right decisions enough of the time. Take them seriously but not that seriously. So when faced with a situation that they haven’t been taught the exact tools for, scientists will weigh the problem as best as they can, and sometimes they tell themselves — rightly or wrongly — that what they’re doing is good enough, and they do it. Sharpe makes excellent points about why there is a communication gap and what to do about it. I hope the 2 frames notion complements that. Scientists have to make progress with limited resources, which means they are constantly making implicit (and sometimes explicit) cost-benefit calculations. If adopting a statistical innovation will require time up front to learn it and perhaps additional time each time you implement it, researchers will ask themselves if it is worth it. Of all the things I need or want to do — writing grants, writing papers, training grad students, running experiments, publishing papers — how much less of the other stuff will I be able to do if I put the time and resources into this? Will this help me do better at my goal of discovering things about the natural world (which is different than the goal of the statistician, which is to figure out new things about statistics), or is this just a lot of headache that’ll lead me to mostly the same place that the simpler way would? I have a couple of suggestions for better dialogue and progress on both sides. One is that we need to recognize that the 2 frames come from different sets of goals – statisticians want to understand statistics, scientists want to understand the natural world. Statisticians should go beyond showing that something is provably wrong or right, and address whether it is consequentially wrong or right. One person’s provable error is another person’s reasonable approximation. And scientists should consult statisticians about real-world consequences of their decisions. As much as possible, don’t assume good enough, verify it. Scientists also need usable tools to solve their problems. Both conceptual tools, and more concrete things like software, procedures, etc. So scientists and statisticians need to talk more. I think data peeking is a good example of this. To a statistician, setting sample size a priori probably seems like a decent assumption. To a scientist who has just spent two years and six figures of grant money on a study and arrived at suggestive but not conclusive results (a.k.a. p = .11), it is laughable to suggest setting aside that dataset and starting from scratch with a larger sample. If you think your only choice is either do that or run another few subjects and do the analysis again, then if you think it’s just a minor fudge (“good enough”) you’re probably going to run the subjects. Sequential analyses solve that problem. They have been around for a while, but languishing in a small corner of the clinical trials literature where there was a pressing ethical reason to use them. Now that scientists are realizing they exist and can solve a wider range of problems, sequential analyses are starting to get much wider attention. They probably should be integrated even more into the data-analytic frameworks (and software) for expensive research areas, like fMRI. Sharpe encourages statisticians to pick real examples. Let me add that they should be examples of research that you are motivated to help. Theorems, simulations, and toy examples are Frame 1 tools. Analyses in real data will hit home with scientists where they live in Frame 2. Picking apart a study in an area you already have distaste for (“I think evolutionary psych is garbage, let me choose this ev psych study to illustrate this statistical problem”) might feel satisfying, but it probably leads to less thorough and less persuasive critiques. Show in real data how the new method helps scientists with their goals, not just what the old one gets wrong according to yours. I think of myself as one of what Sharpe calls the Mavens – scientists with an extra interest in statistics, who nerd out on quant stuff, often teach quantitative classes within their scientific field, and who like to adopt and spread the word about new innovations. Sometimes Mavens get into something because it just seems interesting. But often they (we) are drawn to things that seem like cool new ways to solve problems in our field. Speaking as a Maven who thinks statisticians can help us make science better, I would love it if you could help us out. We are interested, and we probably want to help too. A little while back I ran across an idea buried in an old paper of Robyn Dawes that really opened my eyes. It was one of those things that seemed really simple and straightforward once I saw it. But I’d never run across it before. The idea is this: when a sample is selected on a combination of 2 (or more) variables, the relationship between those 2 variables is different after selection than it was before, and not just because of restriction of range. The correlation changes in ways that, if you don’t realize it’s happening, can be surprising and potentially misleading. It can flip the sign of a correlation, or turn a zero correlation into a substantial one. Let’s call it the selection-distortion effect. First, some background: Dawes was the head of the psychology department at the University of Oregon back in the 1970s. Merging his administrative role with his interests in decision-making, he collected data about graduate admissions decisions and how well they predict future outcomes. He eventually wrote a couple of papers based on that work for Science and American Psychologist. The Science paper, titled “Graduate admission variables and future success,” was about why the variables used to select applicants to grad school do not correlate very highly with the admitted students’ later achievements. Dawes’s main point was to demonstrate why, when predictor variables are negatively correlated with each other, they can be perfectly reasonable predictors as a set even though each one taken on its own has a low predictive validity among selected students. However, in order to get to his main point Dawes had to explain why the correlations would be negative in the first place. He offered the explanation rather briefly and described it in the context of graduate admissions. But it actually refers to (I believe) a very general phenomenon. The key fact to grasp is this: Dawes found, consistently across multiple cohorts, that the correlation between GRE and GPA was negative among admitted students but positive among applicants. This isn’t restriction of range. Restriction of range attenuates correlations – it pushes them toward zero. As I’ll show below, this phenomenon can easily flip signs and even make the absolute value of a correlation go from zero to substantial. Instead, it is a result of a multivariate selection process. Grad school admissions committees select for both GRE and GPA. So the selection process eliminates people who are low on both, or really low on just one. Some people are very high on both, and they get admitted. But a lot of people who pass through the selection process are a bit higher on one than on the other (relative to each variable’s respective distributions). Being really excellent on one can compensate for only being pretty good on the other and get you across the selection threshold. It is this kind of implicitly compensatory relationship that makes the correlation more negative in the post-selection group than in the pre-selection group. To illustrate, here is a figure from a simulation I ran. On the left X and Y are sampled from a standard normal distribution with a population correlation of rho =.30. The observed correlation among 500 cases is r = .26. On the right I have simulated a hard-threshold selection process designed to select cases in the top 50% of the population. Specifically, cases are selected if X + Y > 0. Among the 239 cases that passed the selection filter, the observed correlation is now r = -.25. The correlation hasn’t been attenuated — it has been flipped! Eyeballing the plot on the right, it’s pretty obvious that a selection process has taken place — you can practically draw a diagonal line along the selection threshold. That’s because I created a hard threshold for illustrative purposes. But that isn’t necessary for the distortion effect to occur. 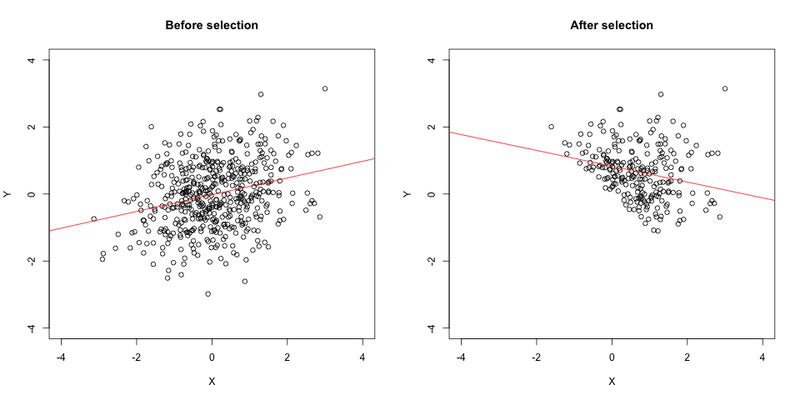 If X and Y are just 2 of several things that predict selection, and/or if they are used in the selection process inconsistently (e.g., with random error as you might expect with human judges), you’ll still get the effect. So you can get it in samples where, if you only had the post-selection dataset to look at, it would not be at all obvious that it had been selected on those variables. To illustrate, I ran another simulation. This time I set the population correlation to rho = .00 and added another uncorrelated variable, Z, to the selection process (which simulates a committee using things other than GRE and GPA to make its decisions). 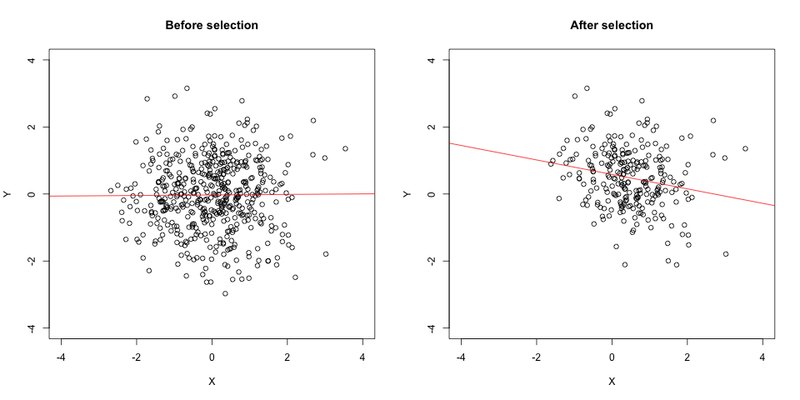 The observed pre-selection correlation between X and Y is r = .01; in the 253 cases that passed through the selection filter (X + Y + Z > 0), X and Y are correlated r = -.21. The correlation goes from nil to negative, increasing in absolute magnitude; and the scatterplot on the right looks a lot less chopped-off. As I mentioned it above, once I wrapped my head around this phenomenon I started seeing it in a lot of places. Although Dawes found it among GPA and GRE, it is a statistical issue that is not particular to any one subject-matter domain. You will see it any time there is selection on a combination of 2 variables that allows them to compensate for each other to any degree. Thus both variables have to be part of one selection process: if you run a sample through 2 independent selection filters, one on X while ignoring Y and one on Y while ignoring X (so they cannot compensate for each other), the correlation will be attenuated by restriction of range but you will not observe the selection-distortion effect. Here are a few examples where I have started to wonder if something like this might be happening. These are all speculative but they fit the pattern. Studies of intellectual ability and academic motivation among college students. You have to have some combination of intelligence and motivation in order to succeed academically and get into college. So the correlation between those two things is probably different among college students than in the pre-selection pool of applicants (and the general population), especially when looking at selective colleges. For example, in a sample of Penn students, Duckworth et al. (2007) reported that grit was negatively correlated with SAT scores. The authors described the finding as “surprising” and offered some possible explanations for it. I’d add the selection-distortion effect to the list of possible explanations. To be clear, I am not saying that the negative correlation is “wrong.” That may well be a good unbiased estimate of the correlation at Penn. This is about what populations it would and wouldn’t generalize to. You might find something similar at selective colleges and universities, but perhaps not in the general population. That’s something that anybody who studies ability and motivation in university subject pools should be aware of. 2. The correlation between research productivity and teaching effectiveness. In a recent op-ed, Adam Grant proposed that universities should create new research-only and teaching-only tenure tracks. Grant drew on sound thinking from organizational psychology that says that jobs should be organized around common skill sets. If you are going to create one job that requires multiple skills, they should be skills that are positively correlated so you can hire people who are good at all parts of their job. Grant combined that argument with evidence from Hattie & Marsh (1996) that among university professors, research productivity and teaching effectiveness have a correlation close to zero. On that basis he argued that we should split research and teaching into different positions. However, it is plausible that the zero correlation among people who have been hired for R1 tenure-track jobs could reflect a selection-distortion effect. On the surface it may seem to people familiar with that selection process that research and teaching aren’t compensatory. But the studies in the Hattie & Marsh meta-analysis typically measured research productivity with some kind of quantitative metric like number of publications or citations, and overwhelmingly measured teaching effectiveness with student evaluations. Those 2 things are pretty close to 2 of the criteria that weigh heavily in hiring decisions: an established record of scholarly output (the CV) and oral presentation skills (the job talk). The latter is almost certainly related to student evaluations of teaching; indeed, I have heard many people argue that job talks are useful for that reason. Certainly it is plausible that in the hiring process there is some tradeoff between an outstanding written record and a killer job talk. There may be something similar on the self-selection side: Ph.D. grads who aren’t interested and good at some combination of research and teaching pursue other kinds of jobs. So it seems plausible to me that research and teaching ability (as these are typically indexed in the data Grant cites) could be positively correlated among Ph.D. graduates, and then the selection process is pushing that correlation in a negative direction. The burger-fry tradeoff. Okay, admittedly kinda silly, but hear me out. Back when I was in grad school I noticed that my favorite places for burgers usually weren’t my favorite places for fries, and vice versa. I’m a enough of That Guy that I actually thought about it in correlational terms (“Gee, I wonder why there is a negative correlation between burger quality and fry quality”). Well years later I think I finally found the answer. The set of burger joints I frequented in town was already selected — I avoided the places with both terrible burgers and terrible fries. So yeah, among the selected sample of places I usually went to, there was a negative correlation. But I bet if you randomly sampled all the burger joints in town, you’d find a positive burger-fries correlation. What does this all mean? We as psychologists tend to be good at recognizing when we shouldn’t try to generalize about univariate statistics from unrepresentative samples. Like, you would not think that Obama’s approval rating in your subject pool is representative of his national approval. But we often try to draw generalizable conclusions about relationships between variables from unrepresentative samples. The selection-distortion effect is one way (of many) that that can go wrong. Correlations are sample statistics: at best they say something about the population and context they come from. Whether they generalize beyond that is an empirical question. When you have a selected sample, the selection-distortion effect can even give you surprising and even counterintuitive results if you are not on the lookout for it. 2. Also, this may be obvious to the quantitatively-minded but “selection” is defined mechanistically, not psychologically — it does not matter if a human agent deliberately selected on X and Y, or even if it is just an artifact or side effect of some other selection process. The tools we have available to us affect the way we interact with and even think about the world. “If all you have is a hammer” etc. Along these lines, I’ve been wondering what would happen if the makers of data analysis software like SPSS, SAS, etc. changed some of the defaults and options. Sort of in the spirit of Nudge — don’t necessarily change the list of what is ultimately possible to do, but make changes to make some things easier and other things harder (like via defaults and options). * Run just the above, then look at the output and see what the means are, then edit the code below. compute x1_c = x1 - [whatever the mean was]. compute x2_c = x2 - [whatever the mean was]. regression /dependent y /enter x1_c x2_c x1x2. Why shouldn’t we be able to do it all in one line like this? regression /dependent y /enter center(x1) center(x2) center(x1)*center(x2). The nudge: If it were easy to write everything into a single command, maybe more people would look at interactions more often. And maybe they’d stop doing median splits and then jamming everything into an ANOVA! 2. By default, the output shows you parameter estimates and confidence intervals. 3. Either by default or with an easy-to-implement option, you can get a variety of standardized effect size estimates with their confidence intervals. And let’s not make variance-explained metrics (like R^2 or eta^2) the defaults. The nudge: #2 and #3 are both designed to focus people on point and interval estimation, rather than NHST. 4. By default the output does not show you inferential t-tests and p-values — you have to ask for them through an option. And when you ask for them, you have to state what the null hypotheses are! So if you want to test the null that some parameter equals zero (as 99.9% of research in social science does), hey, go for it — but it has to be an active request, not a passive default. And if you want to test a null hypothesis that some parameter is some nonzero value, it would be easy to do that too. The nudge. In the way a lot of statistics is taught in psychology, NHST is the main event and effect estimation is an afterthought. This would turn it around. And by making users specify a null hypothesis, it might spur us to pause and think about how and why we are doing so, rather than just mining for asterisks to put in tables. Heck, I bet some nontrivial number of psychology researchers don’t even know that the null hypothesis doesn’t have to be the nil hypothesis. (I still remember the “aha” feeling the first time I learned that you could do that — well along into graduate school, in an elective statistics class.) If we want researchers to move toward point or range predictions with strong hypothesis testing, we should make it easier to do. All of these things are possible to do in most or all software packages. But as my SPSS example under #1 shows, they’re not necessarily easy to implement in a user-friendly way. Even R doesn’t do all of these things in the standard lm function. As a result, they probably don’t get done as much as they could or should. Any other nudges you’d make? Does your p-curve weigh as much as a duck? Over at Psych Your Mind, Michael Kraus bravely reports the results of a p-curve analysis of his own publications. p-curves were discussed by Uri Simonsohn at an SPSP symposium on false-positive findings (which I missed but got to read up about thanks to Kraus; many of the authors of the false-positive psychology paper were involved). Simonsohn has a paper forthcoming with details of the method. But the basic idea is that you should be able to tell if somebody is mining their data for significant findings by examining the distribution of p-values in their published work. A big spike of .049s and not enough <.01s could be the result of cherry-picking. In a thoughtful but sometimes-heated discussion on the SPSP email list between Norbert Schwarz and the symposium participants, Schwarz argues — and I agree — that although p-curve analyses could be a useful tool, they will need to be interpreted cautiously. For example, Schwarz thinks that at this stage it would be inappropriate to base hiring decisions on candidates’ p-curves, something that Simonsohn apparently suggested in his talk. A big part of the interpretive task is going to be that, as with any metric, users will have to accumulate data and build up some practical wisdom in figuring out how to interpret and apply it. Or to get a little jargony, we’ll have to do some construct validation. In particular, I think it will be crucial to remember that even though you could calculate a p-curve on a single researcher, the curve is not a property of the researcher. Rather, it will reflect the interaction of the researcher with history and context. Even setting aside measurement and sampling error, substantive factors like the incentives and practices set by publishers, granting agencies, and other powerful institutions; differing standards of different fields and subfields (e.g., in their use of NHST, in what people honestly believe and teach as acceptable practices); who the researcher was trained by and has collaborated with, etc. will affect researchers’ p-curves. Individual researchers are an important part of the picture, of course, but it would be a mistake to apply an overly simplistic model of where p-curves come from. (And of course they don’t have to be applied to individuals at all — they could be applied to literatures, to subfields, to journals, or really any way of categorizing publications). One thing that both Schwarz and Simonsohn seem to agree on is that everybody has probably committed some or many of these errors, and we won’t make much progress unless people are willing to subject themselves to perhaps-painful soul searching. Schwarz in particular fears for a “witch hunt” atmosphere that could make people defensive and ultimately be counterproductive. The p-values associated with the tests of the polynomial models are generally quite small, some so small as to exceed the computational limits of our data analysis software (SPSS 10.0.7, which ran out of decimal places at p < 10e–22).